The sophisticated and distinctive blunt-end blade of this Guspinese jack knife is made of damask carbon steel, it has a handle with a spring, grips in light ram horn, nails and a brass ring joint. Entirely handcrafted as a unique piece, it has ever-changing finishes and details. This artistic single-piece jack knife features a buffalo horn carved in the shape of a Sardinian wild boar, with a balanced combination of a large bay leaf-shaped blade and an engraved brass joint ring. This precious artefact is entirely hand-made. This pattadese jack knife, with its damask myrtle leaf-shaped steel blade, its striped Sardinian mutton horn handle and its brass engraved guard, is characterized by an exclusive hand-made work. This single-piece guspinese jack knife features a mutton buffalo horn with sophisticated shades, a large bay leaf-shaped blade and an engraved steel joint ring. This balanced and elegant artefact is entirely hand-made. This artistic single-piece jack knife features a buffalo horn carved in the shape of a Sardinian donkey, with a balanced combination of a large bay leaf-shaped blade and an engraved brass joint ring. This precious artefact is entirely hand-made. Efisio Spiga, an artisan with decades of experience, specialized as a cutler and has been working as such for about 18 years. He started to craft Sardinian knives following his great interest for the objects, their technical particularities and their traditional meaning and use. His pleasure to transform and shape the materials, makes him a painstaking and careful craftsman, an artist of great technical skill and well-educated in all crafting stages. Each procedure is skilfully performed, manufacturing steel for the blades, selecting and processing of materials for the handles, which are made of moufflon, mutton, beef, buffalo horns and the warthog tusks and antlers, as well as various types of wood, especially olive trees and the Sardinian juniper. 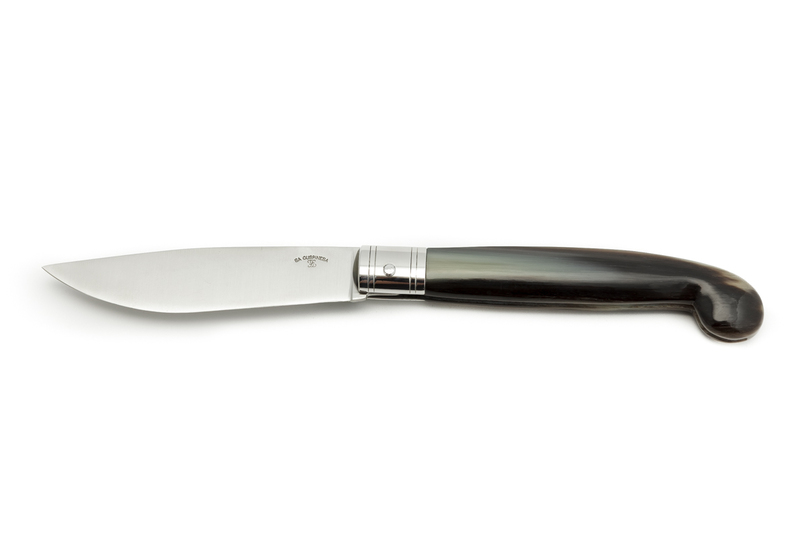 All knives, including those featuring refined shapes and precious materials, are still designed to be perfectly functional and efficient. He participates in trade shows and industry events at national level and his art knives are displayed in the showroom of Villasimius. The production of jack knives includes three local models, pattadese , guspinese and arburese while as for fixed blade knives, he crafts corrine, Sardinian leppe and hunting knives. This peculiar and exclusive collection of knives, featuring handles carved artistically with local animals, such as the wild boar, the eagle, the nuraghe, the hunter, the shepherd, the miner and more, always strictly handmade. Each artefact, a work of art made with passion and dedication in the Non solo coltelli workshop , is designed at the forge, crafted by hand with choice materials and meticulous finishing. Some handles are made of moufflon or ram horn or embellished with gold or silver mokume, nickel silver or brass straps and rivets, with punch-engraved incisions.